MOC - "Avengers Lend a Hand"
It had started out as a normal day taking picture for the Daily Bugle in Central Park. But when Doc Ock started photo-bombing the pictures, Peter Parker changed from his photographer's clothes into his Spiderman outfit. Spiderman had things mostly under control, but Doc Ock was proving to be a little harder to capture than normal. 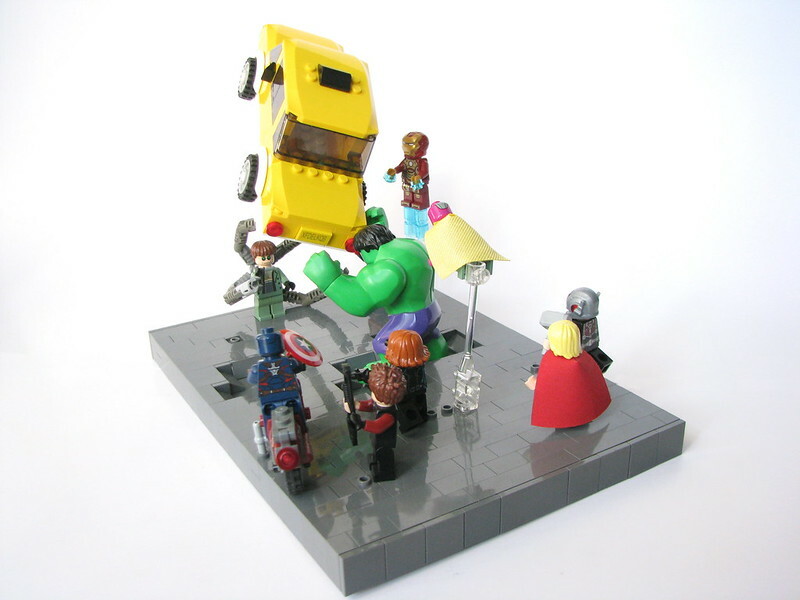 Just then the Avengers, on their way back from destroying a group of Skrulls, stopped to see what the fuss was about. "It's okay guys, I got this!" shouted Spiderman as he dodged a flying taxi. "This guys got 8 arms," said Tony Stark, "You only have 2, we'll pitch in and get this villain taken care of in no time!" "Actually, he only has 6 arms, then 2 legs" mumbled Spidy. "You guys won't let me be an Avenger and now you won't even let me take down my own villains! How is a guy supposed to get any respect around here!" Nice to see the classic Spidey and classic Doc Oc here!